The Colorado Esplanade was conceived by the City of Santa Monica as a vital urban-design element that conveys the spirit of the city. A three-block-long linear plaza along Colorado Boulevard between the new light-rail station on Fourth Street and the historic Santa Monica Pier, the project (which began for PWP in 2011) is not only intended to deliver pedestrians coming from the light-rail to the coast, but also to connect downtown Santa Monica in the north with Santa Monica’s Civic Center district in the south, across the freeway. 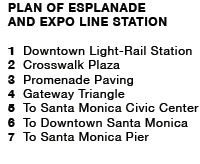 Thus, the Colorado Esplanade is a multimodal thoroughfare that connects thousands of people to all corners of Santa Monica every day. Initially these aspirational goals seemed impossible to achieve because the space available for the project was little more than a sidewalk streetscape. PWP, in collaboration with a team of professionals, City staff, and the people of Santa Monica, was able to find surprising efficiencies that allow for a design communicating the identity of Santa Monica and offering a multimodal route for travelers of all kinds. Early in the analysis and planning phases of the project PWP asked if it was possible to turn the stretch of Colorado Boulevard into a one-way street, posing the question to Fehr and Peers, the traffic consultants for the project, who had a long history of studying traffic issues in Santa Monica. Together, the team hypothesized that turning Colorado to a one-way street running west for the length of the Esplanade would allow one existing lane of vehicular paving to be transformed into pedestrian and cycling zones. Removing a lane of vehicular traffic was a radical notion because Santa Monica (and the greater Los Angeles area) has perennial traffic problems. There seemed to be little chance of gaining traction. Fehr and Peers, however, reviewed the scheme and ran traffic models of the entire downtown area with the changed street. Surprisingly to many, it was determined that changing the boulevard to a one-way street for cars actually alleviated some of the existing traffic issues within downtown Santa Monica. With this finding, PWP went through a series of public meetings and sessions with Santa Monica’s City Council that ultimately resulted in the basis of the final scheme. PWP developed the final design through an extensive community engagement process with the stakeholders associated with the Esplanade including the City Planning Department of Santa Monica as well as other City agencies and staff, Downtown Santa Monica Incorporated, adjacent property owners, and Santa Monica residents who engaged in public workshops and meetings. Using only basic materials, the design for the Colorado Esplanade creates a shared public-space for pedestrians, cyclists, drivers, and buses. 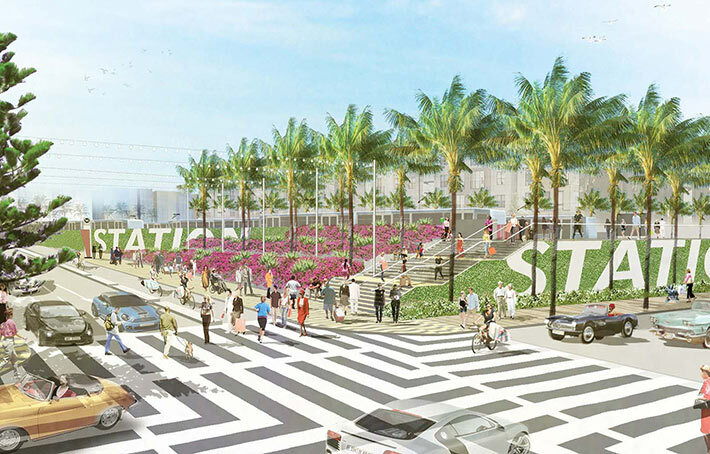 All users of the Esplanade are contained between two rows of trees that are planted at the outer edges of the space, a planted allée that focuses the view on the historic Santa Monica Pier sign (the symbolic end of Route 66). The trees—as well as string lights and their support poles—frame the entire zone and connect the north and south sides of the street. Custom rippled-concrete unit pavers elevate the pedestrian zone and create an identity to the walk that is recognizable the moment visitors step onto it. The Esplanade is also home to Santa Monica’s first bicycle track that allows cyclists to travel in both directions. The bicycle track is separated from the vehicular lanes by a three-foot-wide and six-inch-high curb; the pedestrian walkway is separated from the bicycle track by a sidewalk curb with small seating elements. The new Gateway Triangle creates a framed entry plaza for parks at the City Hall and the Civic Auditorium. The plant palette throughout the project is strong and simple with bold street trees as well as mass plantings that offer color and fragrance.